Grant Opportunities, Greenfield, IN | Greenfield Main Street, Inc. Check back soon to learn more about 2019 grant opportunities. Greenfield Main Street, Inc. (GMSI) will be awarding a limited number of matching grants, on a competitive basis, up to $3,000 per qualifying property to improve building facades and to promote preservation and rehabilitation of historic downtown structures. Through this program, GMSI seeks to foster enthusiasm and prosperity by improving the appearance of downtown Greenfield. 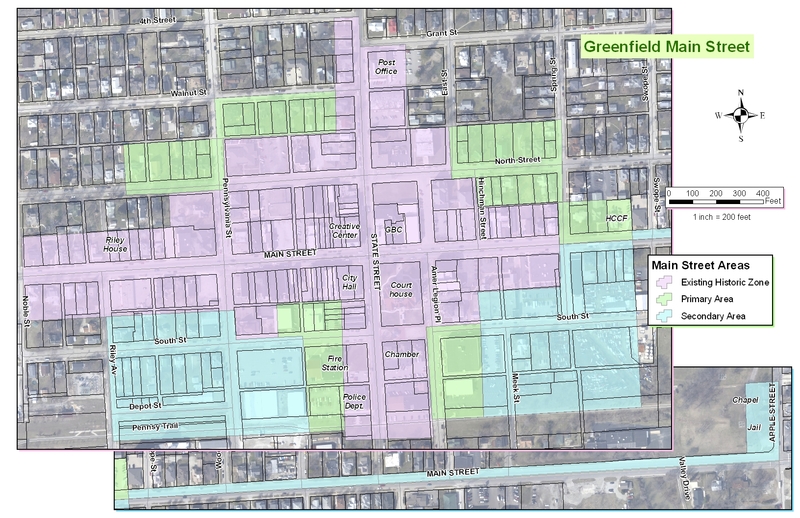 This grant program is designed to assist all property owners and tenants of commercial and residential buildings located in the in the existing historic and primary service area (see map below). This grant will fund applications requesting assistance for the rehabilitation, restoration, or improvement of exterior facades and features in these structures. The grant guidelines and application are available on the Greenfield Main Street website. This program is a reimbursement program for work that will be completed within six months or and otherwise reasonable timeframe after the grant award. Funding awards under this program will reimburse approved expenses. Work will be reviewed and approved using the program guidelines, Greenfield Historic District Design Guidelines, and the Secretary of Interior's Standards for Rehabilitation. Upon completion of the improvement, the grant recipient will provide proof of payment. Grant recipients are required to provide a minimum 50% match and this program will reimburse up to 50% of approved exterior building improvements up to $3,000 per selected property. Applicants are to provide the following information by the submission deadline posted for the grant round. 2. Proof of financial ability to complete the project. A letter from the applicant's bank or other financial institution will suffice. 4. Copy of project cost estimate from contractor.